Hello and welcome to the IWSG blog hop. What is IWSG? Founder of IWSG and author Alex J Cavanaugh explains the group's purpose is "to share and encourage. Writers can express doubts and concerns without fear of appearing foolish or weak. Those who have been through the fire can offer assistance and guidance. It’s a safe haven for insecure writers of all kinds!" You're invited to become a member of this supportive group. The group blogs the first Wednesday of every month, The list of bloggers is always available so you can hop around to the author blogs filled with humor, advice, and thought-provoking topics on writing and publishing. You can find the list of participants at Alex's IWSG page. 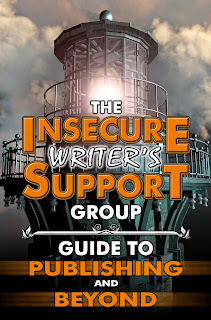 This information-packed guide written by members of the IWSG is filled with advice for writers. Find it at Amazon, Barnes and Noble, Kobo, Smashwords,Goodreads. Are you a member of the group??? I am. I vow 2015 will be the year I do not put things off, but take action to "get 'er done." I even bought a planner with slots for daily, weekly, and monthly planning to actually write down deadlines for me to meet. I must admit I only spent a dollar for it at the Dollar Tree, but I don't need any fancy book cover or graphics to motivate me to use it. Although, the flimsy red plastic cover is not very attractive or inviting for me to pick it up. I read in an article that perfectionism is a common trait of procrastinators. I thought I gave up being a perfectionist when I was 13. Talk about exhausting! Getting every detail correct can drive a person buggy. I fear there are some areas in my life where those old traits of perfectionism come to the surface now and then. The thinking must be that if I can't do a project perfectly, then I'll put it off till I can. Is that how it goes? This is the only explanation I can muster for not writing those deadlines in that planner because I'm afraid I'm not going to make the deadline! Perhaps if I use a pencil to set those dates knowing I could erase them??? 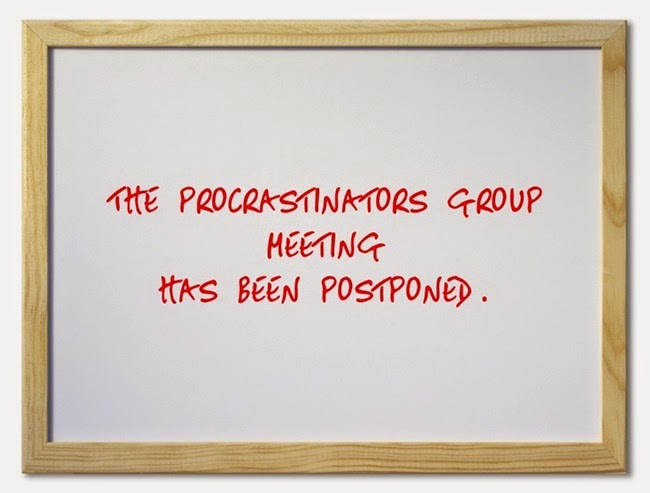 Come on Procrastinators of the IWSG, arise! We must overcome this wretched habit! What's your best advice to conquer this evil frittering away of time? I always use a pencil on my calendar and my address book. Too many changes occur and I can't stand it looking so messy! I too, fight the procrastination bug, sometimes better than others. My only advice is to remind yourself of what happens if you don't push yourself to get whatever it is done that you want to do. Thinking of consequences can often give the "kick in the rear" we all need sometimes! Thanks for commenting on my blog! Happy New Year! I hope we can both conquer our procrastinating this year, JQ! Guilty! I procrastinate because I'm lazy- I only wish it was because I was a perfectionist! Lisa, yes if we can only look ahead and see what will happen if we Don't get 'er done. Thanks. Chrys, okay. You mean you have this syndrome too?? Thanks for stopping in. Um, sure Anna. Let's do it when we can get around to it! LOL..
Ooh, Elizabeth, that's pretty harsh. It takes a lot of work to put off doing a job, so I don't think you're lazy at all. Thanks for stopping by. This is funny, because I just wrote a Facebook status that said I was amazed at how thoroughly I avoid doing something I don't want to do. Yes, I'm Queen Procrastinator. And I'm definitely a perfectionist. I keep trying to find solutions, but have yet to do so. Good luck to you! I too am determined to delete procrastinator from my vocabulary from my daily actions! You go girl! Happy New Year! Hi Shannon, or shall I address you as Queen Procrastinator? You haven't found the solution to keeping away those perfectionist tendencies? Me either. When you find out, please get back with me! Thanks. Hi Donna, Good luck with deleting procrastinator from your vocabulary! Happy New Year to you! !